For a limited time only Elizabeth Renee Esthetics is offering the perfect pre-holiday pumpkin peel treatment for only $49. This quick half hour treatment is designed to brighten the skin, soften lines, ease dryness, help even out skin tone and minimize redness and irritation. With Glow on the Go you’re sure to look and feel radiant, healthy and glowing, just in time for the holidays. Why a Pumpkin Peel ? The mighty pumpkin, when fermented, contains more than 100 nutrients, including collagen building amino acids, skin renewing beta carotene (think retinol) and moisturizing fatty acids. It’s not surprising that the skin eagerly accepts these nutrients and responds by producing a very happy, healthy glow. Suitable for all skin types, the fermented pumpkin enzyme offers benefits to both dry and oily skin, producing results in a natural way. This natural exfoliation process removes unwanted debris from pores, enhances cellular regeneration and enables the skin to better absorb active ingredients, such as concentrated serums and moisturizers. The pumpkin enzymes in Glow on the Go are incredibly useful for the biological processes of skin cells. With a proprietary combination of super fruits, this is the treatment of the future. Fruit enzymes are gentler and safer than other peels, with superior anti-aging antioxidants that provide healthy benefits for your skin. 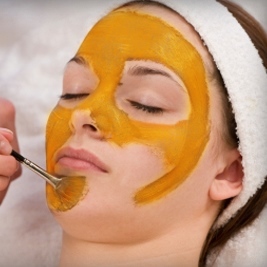 At Elizabeth Renee Esthetics, our expert estheticians have the knowledge to choose the perfect timing and strength of your pumpkin peel to achieve maximum results for your skin. Skin is cleansed and effectively analyzed to determine the correct pumpkin enzymes for your skin type. A thin coat of pumpkin enzyme peel is applied for 3-10 minutes and gently removed with warm towels. A hydrating serum is applied using cold ultrasound to deeply moisturize new cells and soothe the skin. We finish with a few drops of FijiGirl Facial Oil (with retinol & emollients) followed by a protective sunscreen. Your skin will feel incredibly soft and look impeccably smooth. WHAT IS AGING YOUR SKIN?